What work opportunities does climbing have to offer? We interviewed six people who work in the industries to find out more. Getting into climbing can open up a number of different career paths and work opportunities, such as: instruction, industrial rope access and a huge number of jobs in outdoor retail and the related industries. Being able to show and prove you have an interest in climbing and the outdoors increases your employability in these sectors massively. So let's delve into these sectors a little. There are many levels of qualification which can allow you to work within a climbing wall, take groups on small or large cliffs, and lead people across mountains in Britain and abroad. You can work for yourself, a climbing wall or for outdoor centres. The work may involve training people in key skills from belaying to learning navigation, coaching movement techniques, route setting, guiding people up famous rock and ice climbs like Flying Buttress on Dinas Cromlech or Point Five Gully on the Ben Nevis. Having the ability to rig ropes for safeguarding on buildings and structures opens up masses of work in the UK and abroad. The work can be very varied and incredibly interesting: from re-pointing the outside of churches, helping construct huge buildings such as the Millenium Dome, painting bridges to working offshore on oil rigs or wind farms. A one-week IRATA Level One course is often the stepping stone into this line of work and there are many providers of these in the UK. If you have knowledge of the confusing collection of equipment necessary for the many activities based around climbing and outdoor pursuits, then you'll be primed for entering the world of the outdoors industries. The array of jobs available is almost as confusing as the gear! For instance, there are jobs involving shop work, business management, sales representatives, marketing, engineering, designing, event management and many more. I’ve always preferred the open spaces of the outdoors and would spend as much time as possible outside when I was growing up. Living on a remote farm in South Africa most of my childhood definitely had an effect on me! I chose to study Zoology at Bangor University because of its location near the mountains and that’s when I discovered climbing. In my spare time I also started dabbling with photography, design and websites. I had no idea at the time but these were the skills that led me to marketing and I’ve continued to learn and build on them ever since. I’m now studying for formal qualifications in Marketing so that I can become a Chartered Marketer. What made you decide to get into the outdoor retail industries sector? I saw an ad for a job at DMM and it seemed like a good fit for me. They were looking for someone who had technical skills to help out with marketing and gave me the opportunity to build my skills and grow the marketing side of the company through my own projects like introducing social media and launching a new website. Seven years later and we now have a marketing team. There are a variety of aspects to the job involving lots of different people and I love the challenge of bringing all those elements together to create something. Since I do the product photography I also get to play with new products before they are launched. What have been some of the top experiences whilst working? For me, it’s always rewarding to finish big projects and see the end result, then building on that to make the next one even better. The Pivot belay device has won a couple of awards in the last year and it’s great when our products get recognition like that. Deadlines can be tough and things don’t always go to plan so there’s a lot of problem solving and flexibility required, but we work together as a team and it all comes together in time. Got any tips for people contemplating a job in in the industry? Practical experience is just as important as qualifications. Technology means things move fast so you should always be learning and developing your skills. Also, having a good knowledge of the industry and products is invaluable. I’m from Bethesda in North Wales and have lived there most of my life. I started climbing aged 13, was instantly hooked, mostly on outdoor trad climbing although I did compete in the BMC Youth Climbing Series until I was about 16. I was very fortunate to learn to climb with some very good role models and strong climbers who lived around Snowdonia at the time and they helped push me and teach me good, safe rope-work skills. Since then, I’ve climbed across the world in places such as California, Patagonia, Jordan and the European Alps. My speciality is probably alpine and big wall climbing although I love almost all types of climbing. I try not to forget about the real world as well but having fun in the outdoors is one of my main priorities, whether it be climbing, biking, kayaking or running. What made you get into instruction and the outdoor industry sector? I was in Sixth Form, contemplating university, and decided to get a deferred place to study history and politics following a gap year (or yah depending on where you’re from!). I had a flexible cleaning job at the time, some basic sponsorship, as well as climbing wall work which funded some cheap climbing trips. I quickly realised that I could make a career out of my passion rather than fall into debt doing a degree that wouldn’t necessarily take me anywhere. I started writing articles for outdoor publications (such as Climb, Climber, Summit, Rock & Ice, Trek & Mountain) and then realised I could sell about one in 2000 of my climbing shots. My climbing improved and I began to make some money out of climbing sponsorship, not a salary, but enough to put towards my year's climbing trips and to be able to take a month or two off work to go on them. 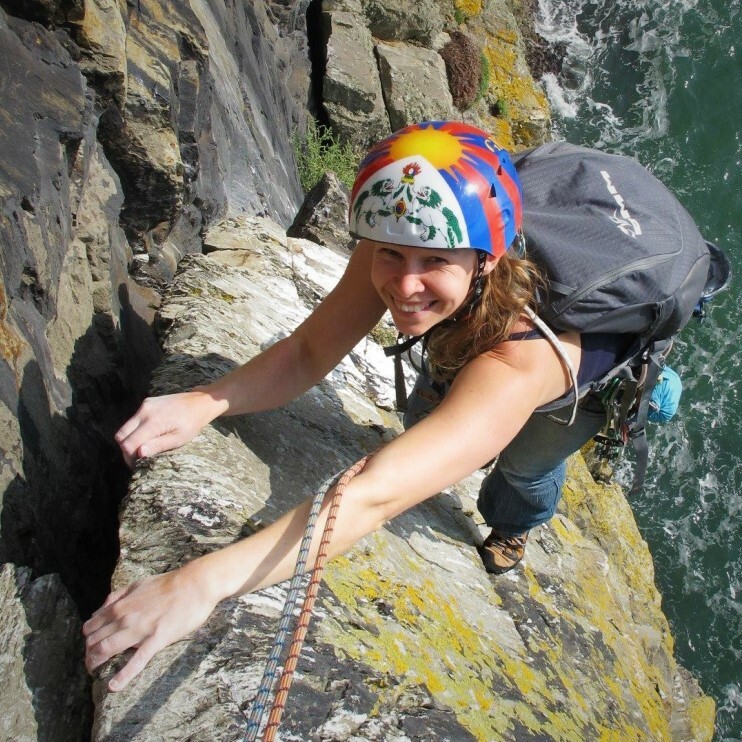 I also progressed through my climbing qualifications quite quickly and once I got my MIA (Mountaineering Instructor Award) I began to get some fantastic work opportunities teaching people the activities I love. My favourite aspects of the job are definitely its flexibility, its variety, the opportunities to work in amazing places outdoors and to teach, encourage and improve people’s climbing abilities as well as occasionally providing a life changing experience if everything falls into place at the right time. The downsides for me are working away from home too much (I spend over 60% of the year away from home through work and holiday) and because of that also a lack regularity and consistency, which means that my personal climbing suffers badly due to regularly working away from any climbing and training facilities – for example close to three months of no personal climbing or training in the winter time. I’m working on changing both of the above! Any tips for people contemplating a job in the industry? If you want to become an outdoor instructor, then think about what sort of work you want to do. Centre work can often be monotonous and have a high burn out rate, whilst working solely as a private provider takes a lot of business acumen and can remove you from the reason you started out in the first place. If you’re after qualifications then you can very rapidly gain enough experience for basic qualifications in a variety of outdoor activities (CWLA, ML, Level 2 Mountain Bike Leader, Level 2 Kayak and Canoe), alongside that it might be worth getting a mini bus license (D1). If you have aspirations on becoming a guide, then consider whether it’s worth going for your Mountaineering Instructor Awards first (MIA & MIC). They undoubtedly will help ease the process of becoming a guide but are reasonably expensive and are extra training and assessment courses in their own right. Also, think ahead to how your body will be after thirty years of lugging rucksacks up hills day in day out, you might want a plan B, or to pace your work more carefully. If you’re looking at getting sponsored and becoming a professional climber, then carefully consider the pros and cons. 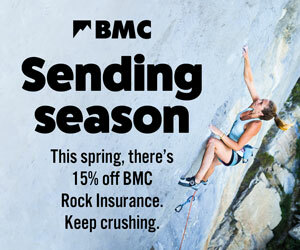 Very few British climbers receive any cash from sponsorship. A friend worked out that the number of UK based climbers genuinely earning over £10,000 could be counted on one hand, so you’re not going to get rich out of it! It’s also worth being a bit cynical about any sponsorship deals and making sure that you get a fair deal out of it. If you end up having to attend multiple trade shows, give talks… then consider them as days of work and if you’re only receiving a few free pairs of shoes then you might as well just work those days and buy them! I grew up in North Wales where I discovered a passion for climbing. I moved to the Lake District as a teenager and in the sixth form I studied Outdoor Education BTEC and an IB certificate in Technology. I made a decision when I left school to start work instead of going to university. I’m really glad I made that decision and feel lucky that I now have a full-time job as a rope access technician, travelling around Britain. When I’m not at work I mostly climb, or rest for my next day climbing. 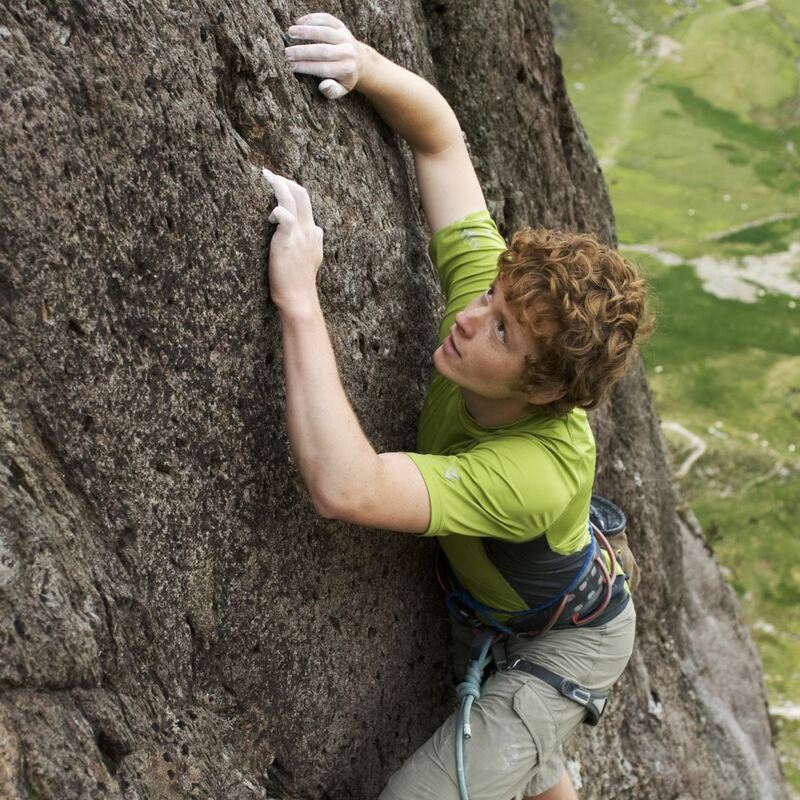 I can usually be found climbing around the Lakes, bouldering with friends, or on the sport climbs of Yorkshire. However I do enjoy the odd indoor climbing competition to test myself as well. What made you decide to get into the IRATA sector? I’ve always loved hands on work, and when a friend told me about rope access it seemed like the perfect job for me. It mixes my love for climbing and rope work, with doing manual work in the outdoors. I wouldn’t be happy with a desk job. It’s just not me. The constant change in what I’m doing all the time, because although I’m always using ropes, the variety of work I do on the ropes is limitless. It can be anything ranging from cleaning up cliff faces, to repairing some of the biggest buildings in Britain. One of my best experiences was my first job in rope access; I was working on a listed bridge in the Lake District repairing some stone work above a small river. It was one of the rare sunny days we get in Britain. I loved working all day fixing the cracks in the bridge, with the only noise being the flow of the water below me. That was the moment I realised I was in the right job. It has also been great travelling around the country and seeing parts of the UK that I’ve not been to before. The teams are always different as well so you get to meet loads of people which is really interesting. Although I love travelling with my job, one of the main downsides is probably the fact that because of all the travel it can be hard to organise when to meet up with friends from home. One of the biggest things that got me a job was the fact that I paid for my IRATA Level 1 (rope access) course myself. 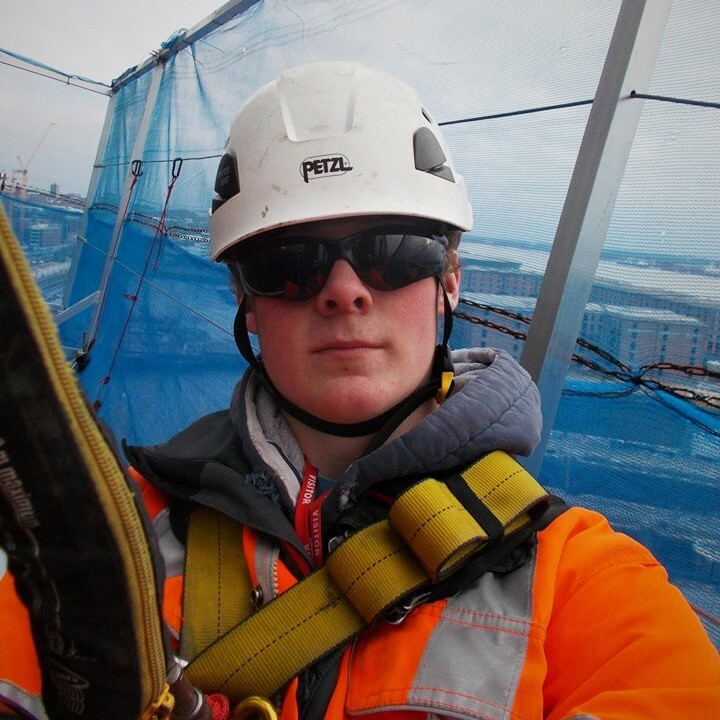 It meant that I already had a rope access qualification on my CV and I guess it showed that I was pretty committed to wanting a career in this sector. Passing your driving test, and having a vehicle, is also beneficial in this industry if you are doing a travel job. If you can get speaking to people in the industry, then they can tell you the right people to contact, and can sometimes help get your CV to the right places. My work is really hands on, so any experience you can get using tools is helpful – such as some mechanical or construction experience. I was born and bred in the mountains of Snowdonia and started climbing at the age of 12. At the age of 14 I emigrated to New Zealand, with my brother and dad. After seven years in the land of the long white cloud I decided to return to North Wales. Between van life, training and climbing I work with a great bunch of people at V12. 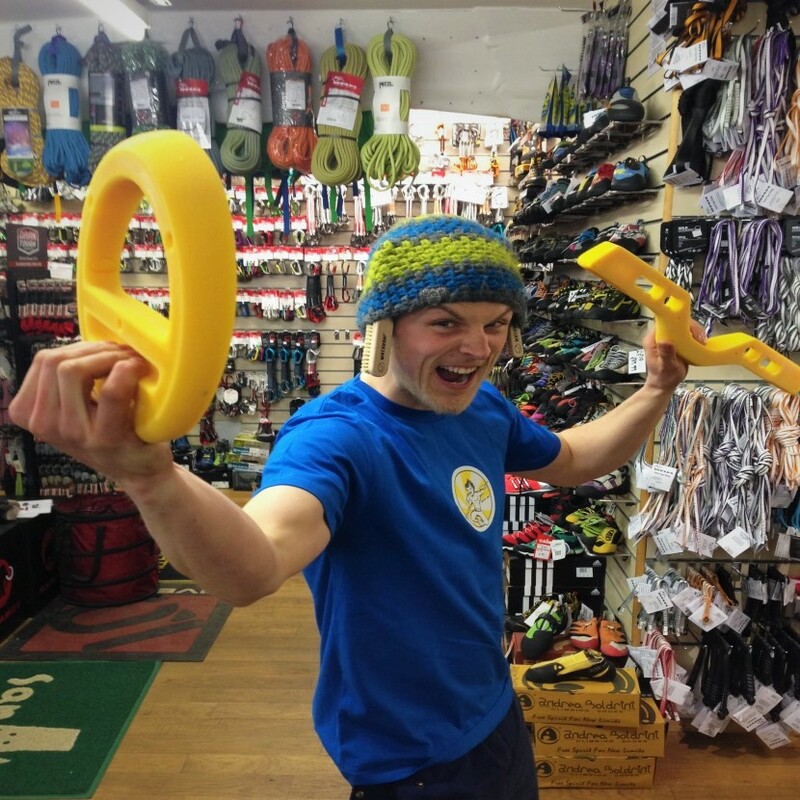 Outdoor in Llanberis as a sales assistant and coffee apprentice. The people I work with, the knowledge I have gained and how it fits in with my lifestyle. Having people return to thank you for the help you gave them. Stock taking, without a doubt haha and being inside on a beautiful day. Any tips for people contemplating a job in in the industry? Be enthusiastic, ask questions and enjoy. I started climbing and walking when I was a teenager at school, mostly on Dartmoor with occasional trips to Snowdonia and the Lake District. Whilst at university in Aberystwyth I discovered alpine climbing. After university a move north enabled me to extend my climbing CV with trips to Scotland, the Alps and the USA. Working freelance after completing a training scheme at Plas y Brenin allowed the climbing-work balance to be the right way around! Some brilliant adventures in the Alps, Himalayas and Scotland followed. Carving a career as an outdoor instructor with short-term contracts and then a permanent job (albeit with plenty of time off in lieu!) saw me progress through the Mountain Training awards to become a holder of the Mountaineering Instructor Certificate (this award qualifies me to work throughout the UK summer and winter in climbing and mountaineering). 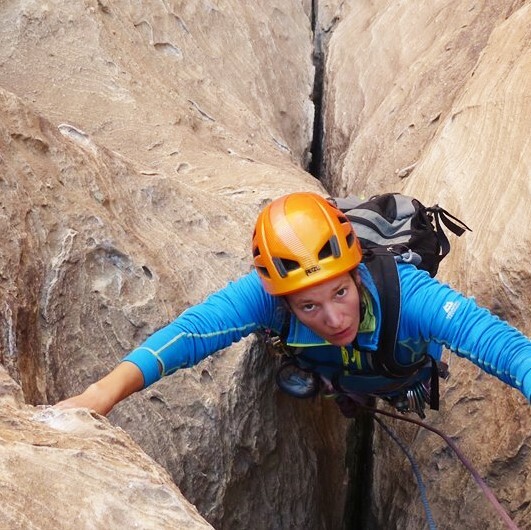 Plenty of climbing adventures have been had along the way with particular highlights being ski mountaineering in Morocco (even though we were unlucky with the poor snow conditions), rock climbing in Wadi Rum, Jordan, numerous ascents and days skiing in the European Alps, and some amazing long rock climbing trips in the USA. After I had passed the MIC I decided that I wanted to make sure I used it, and was lucky that my departure from Ogwen cottage resulted in a job five minutes down the road at Plas y Brenin – winters ever since have been a joy to behold in the Scottish highlands! What made you decide to get into the instruction sector? After finishing a Geography degree at Aberystwyth I was unsure of what I wanted to do next. I did know that I wanted to spend more time climbing and I saw an advert to be a Centre Assistant at Plas y Brenin that sounded good – lots of days off to go climbing! Once I had finished the 15 months there I had a load of qualifications that allowed me to work as an instructor. I never had a grand plan to be an outdoor instructor, but like working outside and once I had some qualifications it allowed me to earn money to go on some great climbing trips. Getting out in the mountains and sharing my passion for climbing and mountaineering with people from a huge variety of backgrounds. 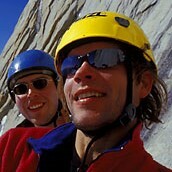 Sharing knowledge and experience with people to help them become better climbers, leaders or instructors is rewarding. Finding the best way to teach an individual a new skill or help people develop their skills in a tricky unhelpful environment is a challenge I really enjoy. Getting to bag Munros & Corbetts and tick off routes whilst at work is pretty good too! Aonach Eagach ridge on a perfect winters day with three super keen school kids; this was the best day of a mega week with this team summiting Ben Nevis after climbing No 4 gully, climbing in Stob Coire nan Lochain and bagging two other Munros in Glen Coe. Lots of days out in the Scottish winter are especially rewarding but this week in particular really stands out. Being out in weather that you wouldn’t choose to be out in, trying to make the best of a day for your clients – this is rewarding but when you have a string of bad weather weeks it does become tiresome. I think as you mature the questions about injury and your body wearing out come to the front of your mind more often – many instructors are freelancers and this is a serious concern for those who are self employed. It is worth thinking about a back up plan! Climbing at work is different to climbing for yourself – you have days when you can do the routes you fancy because they are the right route for your client, but you have a lot more days when you are doing the same old routes or visiting the same venues because that is the best place to teach people those skills. You cannot expect to be guiding people up classic routes in the Pass or at Gogarth straight away when you go into this industry. Most people have spent time working up from a multi activity type of work and then a few are lucky enough to be able to specialise in the aspect they enjoy most. Being an outdoor instructor is not necessarily about being a climbing instructor – the best thing about working on a river or lake in a boat or with a head torch in a mine is the skills you learn about looking after people that are transferable to other outdoor sports. Group management skills are vital whether your group is two or 10, working outside is a constantly changing environment be that the weather, the tides, the terrain or the people in your group. Being an outdoor instructor is managing all these things to provide people with a safe, interesting and fun day out. I’ve been hill walking all my life, then climbing since age nine. At secondary school I got really into climbing, then chose Sheffield Uni so I could live near the grit, (studied geology!). Before and during Uni I worked in the warehouse at Lyon Equipment Ltd, giving me some insight into the climbing equipment industry. What made you decide to get into IRATA and instruction? After graduating I wasn’t sure what I wanted to do. No career path seemed particularly tempting, and my main plan was to avoid the 9-5 and do something interesting. Rope access remains relatively well paid (£100-£300+ a day depending on experience and location), and most of the work is contract-based, allowing you to work as much or as little as you like. It helps keep you climbing fit, and the technical knowledge, hauling and rope rescue skills give me a lot of confidence when on big routes. Nowadays being a family man I’m mainly running my own company teaching rope access, which is more of a regular 9-5 but is still flexible and fairly well paid. Getting to work on some grand architectural projects like the Sage in Gateshead - getting involved with a big project and learning about modern industrial technology. Then looking back and thinking ‘I helped build that’. Being paid to climb the kind of structures urbex guys risk life and liberty to access. Watching the sunrise over from the roof of a highrise, sliding down the cable on a cablecar to practise rescues, hanging out with Conrad Anker on a portaledge in central London to promote The North Face. It can be dirty, awkward and plain hard work. Ever been uncomfortable on a hanging belay? One nightshift installing xmas decorations involved over 8 hours suspended in a harness, without a break. Another involved squeezing through pipes on top of a furnace cleaning off bitumen, I ended up soaked head to foot in white spirit and had an allergic reaction where my leg-loops chafed... And come the weekend sometimes the last thing you want to do is put a harness on – those weeks I just go bouldering. If you are a climber you should have a head start. Climbers pick up the skills and progress quicker, and many rope access managers are climbers and are more likely to give a climber a start. Many jobs are manned-up by word of mouth, so make friends and swap phone numbers. What is it like to combine your love of the outdoors with earning a living in the outdoor industry? Sarah Stirling catches up with a mountain leader, a product designer, a filmmaker and an event organiser and asks: is your job as good as it looks, and how do you go about getting a job like yours?